The Sunday of the "May Long" weekend marks the annual opening to the public of the next running season. Bring your family. Bring your friends. Come and experience an interpretive journey on the 1.6 km of track which is currently operational. Another 0.5 km of track was also completed in 2016 and will occasionally be available on public run days. This depends mostly on the availability of crews and volunteers. We are open to the public every Sunday between 11:00AM and 4:00PM (LAST TRAIN LEAVES AT 3:45), weather permitting, until the Canadian Thanksgiving weekend in October. We are, 100%, a volunteer organization and as such, the park is, unfortunately, NOT open to the public on Saturdays or weekdays except for special events as detailed below or as announced on our main page. Admission to the park is free. The cost of journeys is $3.00 each. Ticket Bundles of 8 for $20.00 and 25 for $50.00 are also available. We accept Visa, MasterCard and Debit cards at the register! Cash is still accepted as well. :-) Children 2 years of age and under ride for free but must be accompanied by an adult. In addition to being open "every Sunday", we are also open on the following "special" days. Additional events may be posted as they are scheduled over the season. Our first Halloween Run / Airdrie FoodBank Fundraiser was held in 2016. We were graced with exceptionally good weather (almost 17�C). We collected some 200 grocery bag equivalents, including $200 in donations. 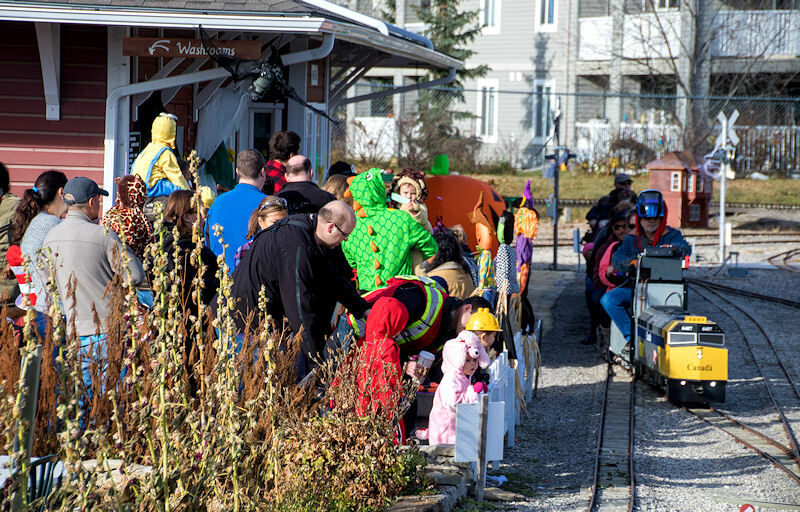 In 2017,despite cold temperatures and very high winds, the event was even more successful.That day we hosted the second largest ridership attendance of the season. Attendees contributed 1,050 lbs of food (about 190 grocery bag equivalents valued at $2,700) PLUS $266 in donations. We are extremely greatful to all who participated. Both events were lots of fun and saw some pretty amazing costumes. It was wonderful to see those happy smiling faces coming out for our last run of the year. We aim to continue this tradition in 2018. There will be free journeys for people in costume or those bringing food bank donation.